DALLAS, TX (July 2, 2015) – Janie Fricke, a two-time “CMA Female Vocalist of the Year,” past Grammy nominee, and a voice of some of the most recognizable advertising jingles ever, has yet another passion, textiles and fabrics. JFC is carried in specialty boutiques around the country and is showcased in the Dallas, TX showroom Touch of France, located in the prestigious Dallas World Trade Center. Items are available at JanieFricke.com for retail and wholesale market buyers. 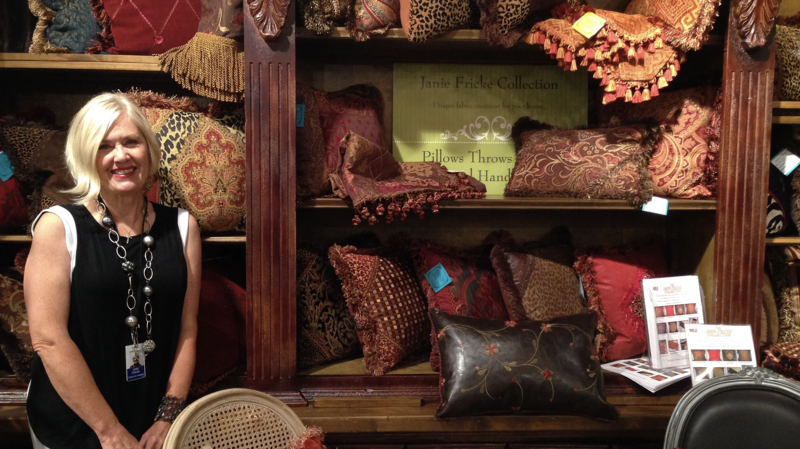 With the popularity of her line, Janie has recently launched janiefrickecollection.com specifically for professional interior designers highlighting her products and fabrics. Raised on a farm in Indiana, Fricke began singing in church, and later turned that talent into a career which began as one of the marketing industry’s most successful jingle singers. Long before her success as a country artist, millions of people became familiar with Fricke’s voice through ads for United Airlines, Coca-Cola, 7-Up, and Red Lobster. She soon became a session singer where she was singing background in the studio with some of the biggest country stars of the late 70’s and early 80’s, including Loretta Lynn, Eddie Rabbitt, Crystal Gayle, Ronnie Milsap, Barbara Mandrell, and Mel Tillis. After a string of duets with such greats as Merle Haggard and Moe Bandy, Fricke landed a solo recording contract in the early 80’s and scored several hit singles, including “Don’t Worry ‘Bout Me Baby,” “He’s a Heartache” and “You’re Heart’s Not In It.” She won CMA’s coveted “Female Vocalist of the Year” in 1983 and ’84 and has been nominated for three Grammy Awards. She has been credited with over 1,600 album projects and scored 36 hit singles.